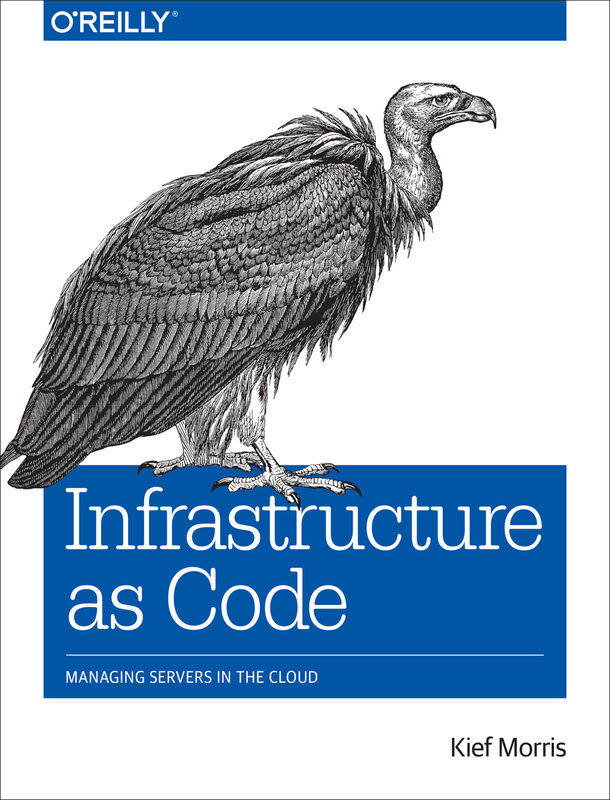 O’Reilly has made my book-in-progress, “Infrastructure as Code”, available for sale as an “Early Access” release. This is essentially a rough draft that you can buy in electronic form (Kindle, PDF, EPub, etc. ), which we update as I go along. If you buy the early access release, you’ll get the final release (also in electronic formats) when it’s published. We’ve published an update with several new chapters, and revisions to previous chapters based on feedback. 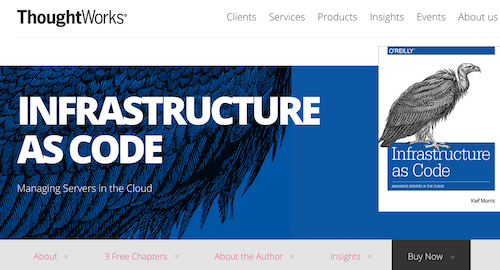 I posted some details on the update, and how I’m finding the process so far, on the Infrastructure as Code book blog. My job involves helping organizations adopt new technologies and ways of working in software development and infrastructure management. One of the most common objections we get is that these tools and practices are commonly used by newer organizations, so may not be right for more established companies. This gets raised even by smaller, newer companies who worry that they need to behave like larger, established companies if they want to become large and established themselves. But large clients who are being eaten alive by newer companies like Amazon (especially Amazon) also raise the concern that they are too big, too important, and work with too much money and sensitive customer data to risk working like a wild new startup. There’s an implication that the new generation of companies built on the Internet, and those who have successfully shifted into the new way of working, don’t have the heavy responsibilities of established companies, and so aren’t as rigorous in how they operate. But I’ve spent too much time inside those established companies to take this objection seriously. The way large companies, even global financial institutions, run their IT is sausage-factory stuff, wrapped up in complicated hierarchies, exhaustive process documentation, and expensive brand-name software. 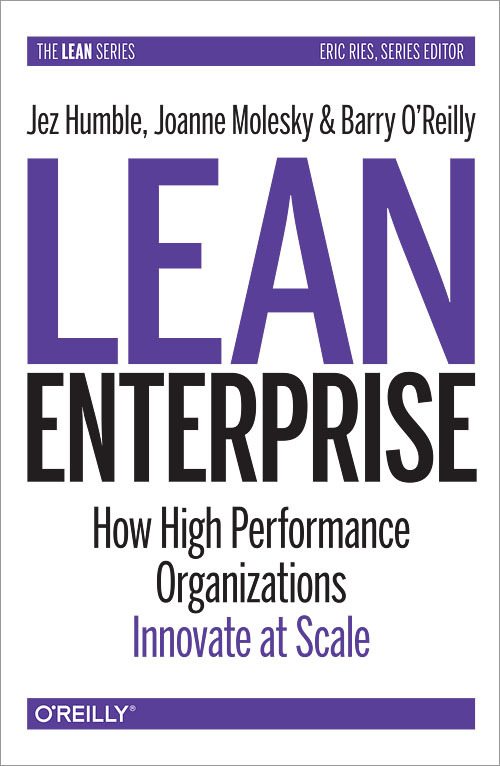 Which brings us to the recently published book, Lean Enterprise: How High Performance Organizations Innovate at Scale. Written by three of my colleagues (one now former), it goes beyond agile software development to look at larger organizational challenges like risk management, marketing, culture, governance, and financial management. All the boring, serious stuff that are necessary to make a company work. Agile software development is about stripping out the unnecessary, and doubling down on the things that really work, like testing. Historically, successful businesses have done this from top to bottom, end to end. All of the garbage that has come to be seen as the way serious businesses run are a sign of a stagnating organization that doesn’t understand how to perform well, so is settling for mediocrity. Joanne, Barry, and Jez have written a book that will hopefully inspire people to question business as usual, and think about business as more. Infrastructure automation has become a mainstream theme in our industry, but automation without Infrastructure as Code practices only spurs the growth of chaotic IT sprawl. Organisations that depend on IT are still held back by their inability to quickly and reliably adapt to business challenges and opportunities. IT Ops people continue to be bogged down in firefighting, with barely enough time to keep systems running, leaving little time for fundamental improvements. Virtualization and cloud (IaaS, Infrastructure as a Service, in particular) have forced the need for automation of some kind. In the old days, the “Iron Age” of IT, infrastructure growth was limited by the hardware purchasing cycle. Since it would take weeks for a new server to arrive, there was little pressure to rapidly install and configure an operating system on it. We would slot in a CD and follow our checklist, and a few days later it would be ready. But the ability to spin up new virtual machines in minutes required us to get a lot better at automating this process. Server image templates and cloning helped get us over the hump. But now we had a new problem. Because we could, assuming enough overall capacity, spin up new VMs at the drop of a hat, we found ourselves with an ever-growing portfolio of servers. The need to keep a constantly growing and changing number of servers up to date and avoiding Configuration Drift spawned new tools. CFengine, Puppet, and Chef established a new category of infrastructure automation tool quickly adopted by the early adopters, those nimble organisations who were taking full advantage of IaaS cloud as it emerged. These organisations, whose IT was typically built around Agile and Lean mindsets, evolved “Infrastructure as Code” practices to managing their automated infrastructure. The essence of Infrastructure as Code is to treat the configuration of systems the same way that software source code is treated. Source code management systems, Test Driven Development (TDD), Continuous Integration (CI), refactoring, and other XP practices are especially useful for making sure that changes to infrastructure are thoroughly tested, repeatable, and transparent. The problem is that few of these toolsets are designed to support Infrastructure as Code. Yes, they do automate things. Once you point and click your way through their GUI to create a server template, you can create identical instances to your heart’s content. But when you go back and make tweaks to your template, you don’t have a traceable, easily understood record of the change. You can’t automatically trigger automatic testing of each change, using validation tools from multiple vendors, open source projects, and in-house groups. In short, rather than using intensive, automatically enforced extreme change management you’re stuck with old-school, manual, “we’d do it more thoroughly if we had time” change management. The definitions used to create and update system configurations should be externalizable in a format that can be stored in off the shelf version control systems such as Git, Subversion, or Perforce. This enables the adoption of a wide variety of tools for managing, validating, and testing software source code, rather than locking you into a single vendor’s toolset. It also gives you a history of every change, along with who made it and (hopefully) why, and the ability to roll back. Without the ability to ensure that every change is quickly and easily tested as a matter of course, we’re forced to rely on people to take the time to manually set up and run tests, even when they’re under pressure. Without visibility and openness of configuration changes, we end up locked into the limited toolset of a single vendor, and deprive ourselves of a huge ecosystem of tools for managing software changes. The defining characteristic of our move beyond the “Iron Age” into the “Cloud Era” is that infrastructure can now be treated like software. Ensuring we’re able to bring the most effective software development practices to bear is the key to getting the most value out of this shift. A while back when I was working in a global financial institution we requested two virtual machines for development and testing. Our requirements were for a standard operating system and application server from the IT organisation’s service catalog, nothing special. The VMs were delivered six weeks later. They were configured differently from one another. One of them was broken - the application server failed to start due to permission errors. Why did it take so long to deliver virtual machines, and why could they not deliver consistent, working machines? The IT department had the most expensive virtualisation platform money could buy, and used two different big-brand, top-dollar enterprise automation products for provisioning and configuring systems and software. The organisation also had the most comprehensive, SOX certified, ITIL compliant processes you could have for change management and IT service delivery. That’s why it took six weeks; there were at least five different departments involved in creating the VM and configuring the operating system, user accounts, application server, and networking. The process involves CAB meetings, detailed service request documents, handover documents and security audits. This reaction is puzzling at first glance. Do people really think that more rigorous change management practices are not relevant to larger, older organisations? I suspect the real root of the rejection of agile practices in large organisations is a belief that traditional change management practices work. Or at least, that they would work if properly applied. It certainly sounds like it should work. Spend more time planning and checking changes, get more people to reviewing and approve them, document everything more thoroughly, and evaluate each deviation from plan even more thoroughly, then, surely, the outcome will be of higher quality. An effective IT organisation should be able to deliver a virtual machine in a matter of hours or minutes, rather than weeks. And it should be able to deliver this more reliably and consistently than a traditional process does, ensuring that the VM is fully compliant with corporate standards for security, quality, and conformity. 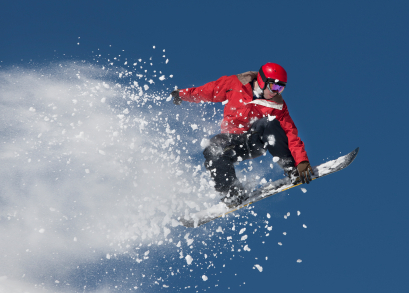 How could the organisation with the six week delivery time for VM’s achieve this? Create standard VM templates with the commonly required packages baked into them. When someone requests a VM, spin up an instance from the relevant template, rather than having a series of steps to configure different aspects of the system. Automate the process for updating these templates. Each time a change is needed or a new version of packages are released, apply these to the template, conduct quality checks (with as much automation as possible), and make the template available. 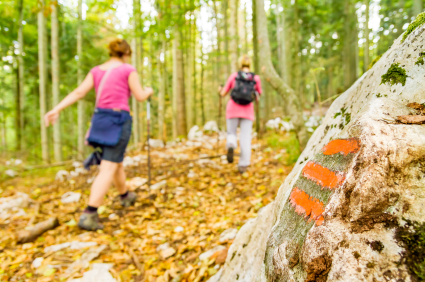 Involve the experts from the various functional specialties (OS, etc.) in creating the automation for updating templates, and for implementing the automated validation, to ensure any change complies with corporate standards. Create a self-service application, so that groups requiring VM’s can use a dashboard to spin them up, entering cost centre and budget approval information as necessary. There is more to it than this, of course, including how to ensure that changes to the standard template are applied to existing VMs created from earlier templates. But this is a start. Martin Fowler has published a couple of bliki entries I wrote. The main piece is a definition of Immutable Servers, which is a term that our colleague Ben Butler-Cole coined to describe the practice of not making configuration changes to servers once they’ve been provisioned. In contrast to the better known Configuration Synchronization approach, where automated configuration updates are continuously applied using a tool like Chef or Puppet, a team that uses immutable servers makes configuration changes to the base images, and frequently destroys and rebuilds servers to keep them up to date. The main advantage of this approach is that, by avoiding changes to a running system’s configuration, you reduce the risks that changes bring. You make changes to a base image, and can then run it through a battery of tests to make sure it’s OK before using it to create server images. This applies the principles behind Deployment Pipelines to infrastructure. Ben and Peter Gillard-Moss have been evangelizing this approach within ThoughtWorks with their use of it on the Mingle SaaS project. Netflix are arguably the pioneers of this approach, and have released some open source tools to help manage AMI images on AWS for this purpose. I’m running into increasing numbers of folks in the DevOps community who see infrastructures managed through heavily automated, continuous synchronization as too complicated and fragile. If the chef-server, puppet-master approach to configuration management is Cloud Computing 2.0, immutable servers are the next thing. Interestingly, at least one commentator has confused this next generation of infrastructure management with pre-cloud practices. My (now-former - sniff) colleague Nic Ferrier responded to this based on a conversation with (still!) colleague Jim Gumbley. These are truly interesting times in the world of IT infrastructure. The way we do things now is quite different from the way we did them ten years ago (albeit probably not for the majority - as with much technology, the future is not evenly distributed), and certainly different from the way we’ll do things in ten more years. It’s a blast to be involved in the shift! On my current project we’re developing an essentially green field application, albeit one that integrates a fair bit of data managed in existing systems, in conjunction with the implementation of a new hosting infrastructure which will be used for other applications once it is established. We want to have a solid Continuous Delivery Pipeline to support the team developing the application, as well as to support the development and maintenance of the infrastructure platform. In order to get the team moving quickly, we’ve kicked this all off using what we’ve called a “tracer bullet” (or “trail marker”, for a less violent image). The idea is to get the simplest implementation of a pipeline in place, priortizing a fully working skeleton that stretches across the full path to production over a fully featured, final-design functionality for each stage of the pipeline. Our goal is to get a “Hello World” application using our initial technology stack into a source code repository, and be able to push changes to it through the core stages of a pipeline into a placeholder production environment. This sets the stage for the design and implementation of the pipeline, infrastructure, and application itself to evolve in conjunction. This tracer bullet approach is clearly useful in our situation, where the application and infrastructure are both new. But it’s also very useful when starting a new application with an existing IT organization and infrastructure, since it forces everyone to come together at the start of the project to work out the process and tooling for the path to production, rather than leaving it until the end. The tracer bullet is more difficult when creating a pipeline from scratch for an existing application and infrastructure. In these situations, both application and infrastructure may need considerable work in order to automate deployment, configuration, and testing. Even here, though, it’s probably best to take each change made and apply it to the full length of the path to production, rather than wait until the end-all be-all system has been completely implemented. When planning and implementing the tracer bullet, we tried to keep three goals in mind as the priority for the exercise. Get the team productive. We want the team to be routinely getting properly tested functionality into the application and in front of stakeholders for review as quickly as possible. Prove the path to production. We want to understand the requirements, constraints, and challenges for getting our application live as early as possible. This means getting everyone involved in going live involved, and, using the same infrastructure, processes, and people that will be used for going live, so that issues are surfaced and addressed. Put the skeleton in place. We want to have the bare bones of the application, infrastructure, and the delivery pipeline in place, so that we can evolve their design and implementation based on what we learn in actually using them. Things can and should be made simple to start out with. Throughout the software development project changes are continuously pushed into production, multiple times every week, proving the process and identifying what needs to be added and improved. By the time the software is feature complete, there is little or no work needed to go live, other than DNS changes and publicizing the new software. Don’t implement things that aren’t needed to get the simple, end to end pipeline in place. If you find yourself bogged down implementing some part of the tracer bullet pipeline, stop and ask yourself whether there’s something simpler you can do, coming back to that harder part once things are running. On my current project we may need a clever unattended provisioning system to frequently rebuild environments according to the PhoenixServer pattern. However, there are a number of issues around managing private keys, IP addresses, and DNS entries which make this a potential yak shave, so for our tracer bullet we’re just using the Chef knife-rackspace plugin. The flip side of starting simply is not to take shortcuts which will cost you later. Each time you make a tradeoff in order to get the tracer bullet pipeline in place quickly, make sure it’s a positive tradeoff. Keep track of those tasks you’re leaving for later. Examples of false tradeoffs are leaving out testing, basic security (e.g. leaving default vendor passwords in place), and repeatability of configuration and deployment. Often times these are things which actually make your work quicker and more assured - without automated testing, every change you make may introduce problems that will cost you days to track down later on. It’s also often the case that things which feel like they may be a lot of work are actually quite simple for a new project. For my current project, we could have manually created our pipeline environments, but decided to make sure every server can be torn down and rebuilt from scratch using Chef cookbooks. Since our environments are very simple - stock Ubuntu and a JDK install and we’re good to go - this was actually more trivial than it would have been later on once we’ve got a more complicated platform in place. Many organizations are in the habit of turning the selection of tools and technologies into complicated projects in their own right. This comes from a belief that once a tool is chosen, switching to something else will be very expensive. This is pretty clearly a self-fulfilling prophecy. Choose a reasonable set of tools to start with, ones that don’t create major barriers to getting the pipeline in place, and be ready to switch them out as you learn about how they work in the context of your project. Put your tracer bullet in place fully expecting that the choices you make for its architecture, technology, design, and workflow will all change. This doesn’t just apply to the pipeline, but to the infrastructure and application as well. Whatever decisions you make up front will need to be evaluated once you’ve got working software that you can test and use. Taking the attitude that these early choices will change later lowers the stakes of making those decisions, which in turn makes changing them less fraught. It’s a virtuous circle that encourges learning and adaptation. It’s tempting to make it easy to get pre-live releases into the production environment, waiting until launch is close to impose the tighter restictions required for “real” use. This is a bad idea. The sooner the real-world constraints are in place, the quicker the issues those constraints cause will become visible. Once these issues are visible, you can implement the systems, processes, and tooling to deal with those issues, ensuring that you can routinely and easily release software that is secure, compliant, and stable. Another thing often left until the end is bringing in the people who will be involved in releasing and supporting the software. This is a mistake. In siloed organizations where software design and development is done by separate groups, the support people have deep insight into the requirements for making the operation and use of the software reliable and cost effective. Involving them from the start and throughout the development process is the most effective way to build supportability into the software. When release time comes, handover becomes trivial because the support team have been supporting the application through its development. Bringing release and support teams in just before release means their requirements are introduced when the project is nearly finished, which forces a choice between delaying the release in order to fix the issues, or else releasing software which is difficult and/or expensive to support. The question of what to include in the tracer bullet and what to build in once the project is up and running depends on the needs of the project and the knowledge of the team. On my current project, we found it easy to get a repeatable server build in place with chef configuration. But we did this with a number of shorcuts. We’re using the out of the box server templates from our cloud vendor (Rackspace), even though we’ll probably want to roll our own eventually. We started out using chef-solo (with knife-solo), even though we planned to use chef-server. This is largely due to knowledge - I’ve done a few smaller projects with knife-solo, and have some scripts and things ready to use, but haven’t used chef-server. Now that we’re migrating to chef-server I’m thinking it would have been wiser to start with the Opscode hosted chef-server. Moving from the hosted server to our own would have been easier than moving from solo to server. Starting out with a tracer bullet approach to our pipeline has paid off. A week after starting development we have been able to demonstrate working code to our stakeholders. This in turn has made it easier to consider user testing, and perhaps even a beta release, far sooner than had originally been considered feasible. There is a common belief in the software development world that a tradeoff exists between speed of delivery and quality, an idea Martin Fowler calls the Tradable Quality Hypothesis. It’s the idea that, in a pinch, you can speed up software delivery by not worrying so much about quality. As Martin points out, people have different understanding of what quality means, but the definition that counts from a delivery point of view is that it’s the attributes that make the software easier to maintain and extend. Developers can work more quickly on code that is easy to understand and free from bugs. So in practice, teams that prioritize speed over quality tend to achieve neither, while teams that prioritize quality, in many cases, deliver code very quickly. However, this isn’t always the case. 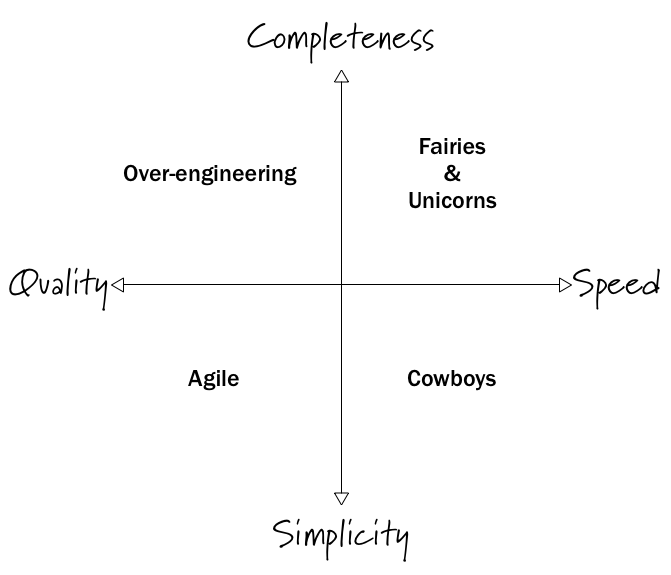 Some teams focus on quality, but end up taking forever to deliver simple things. 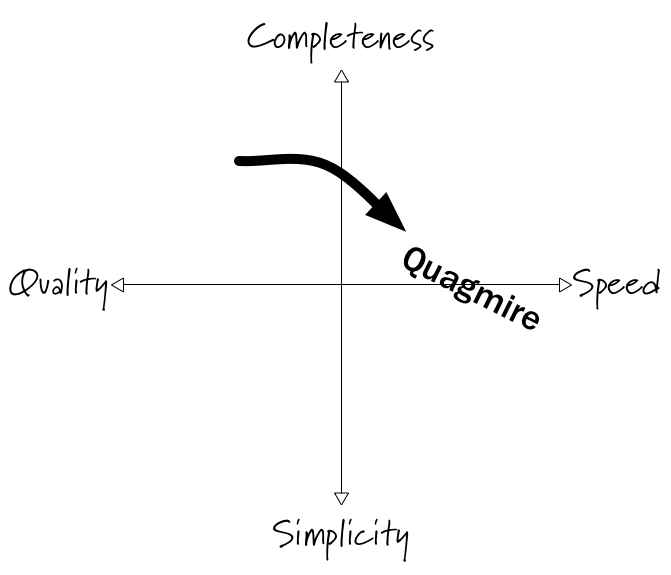 What’s missing from the speed vs. quality tradeoff is a second axis, completeness versus simplicity. 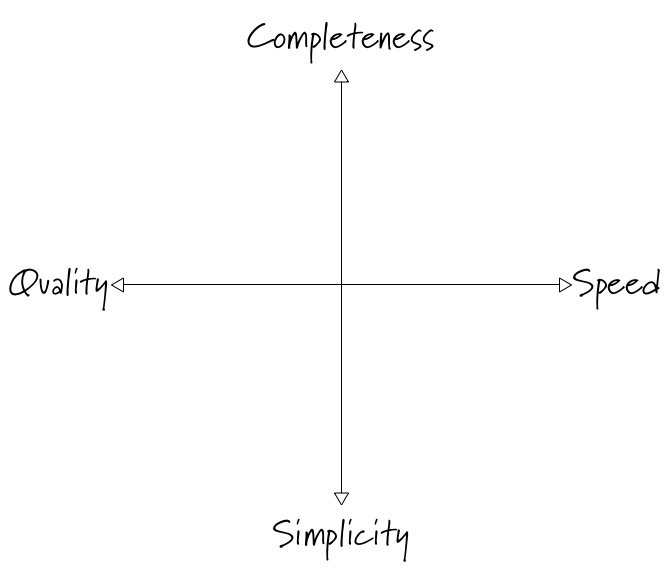 Another word for completeness on this chart would be complexity, but this quadrant represents the aspirations of a team - what the team is trying to achieve - and no team aspires to complexity. Instead, teams try to design and implement software and systems which are complete. A team that prioritizes completeness wants a system that can cope with anything. It can meet completely new requirements through configuration rather than code, easily scale to handle any load, and tolerate any conceivable or inconceivable failure. The problem with this is partly described by the YAGNI principle. Most of what the team built isn’t actually going to be needed. A large proportion of the stuff that will be needed in the future is stuff that the team didn’t anticipate. But the real killer is that adding all this stuff adds more moving parts. It’s more stuff to implement, more stuff to go break, and then it’s more stuff to wade through when working on the codebase. So the team sets out to build the perfect, well-engineered system, but over time the schedule comes under pressure, and the team realizes it needs to step up the pace. Elements of the design are dropped, leaving parts of the system that were already implemented unused, but still taking up space (and adding complexity) in the codebase. There is a nearly inevitable slide into cutting corners in order to get things done, and before you know it, you’re trading off quality (“we’ll go back and clean it up later”) for speed. As we’ve seen, this leads to a quagmire of poor code quality which slows work down, made even worse because of an overcomplicated design and large amounts of unnecessary code. What seems to unite high performing development teams is an obsessive focus on both quality and simplicity. Implement the simplest thing that will satisfy the actual, proven need, and implement it well. Make sure it’s clean, easy to understand, and correct. If something is wrong with it, fix it immediately. Teams that get this focus right are able to reliably deliver high quality software remarkably fast.